Socialist Resistance is publishing its first book. 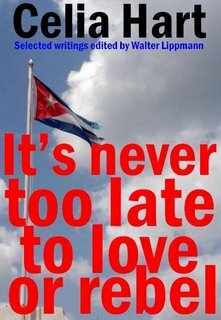 "It's never too late to love or rebel" is a collection of articles, interviews and papers by Celia Hart, a member of the Cuban Communist party. Walter Lippmann has selected and edited the documents in the book. Walter is the editor of CubaNews, which has a leading role in translating and distributing Celia's articles into English. His collection contains Celia's best-known articles written since 2003. It contains a number of recent articles that are not included in Apuntes revolucionarios, a Spanish collection published last year, including an interview with International Viewpoint. It is one of these articles which provides the title of the book. The book returns from the printers in the next few weeks, but we are hoping to be able to show a proof copy of the book to Celia and other attendees at the Socialist Resistance dayschool on Saturday. Unusually for a left-wing book, It's never too late... is aimed at wide distribution. It has an attractive full-colour cover and will be printed professionally in the Demy octavo format which is most widely used by modern publishers. It will be available though both online booksellers, from Socialist Resistance and to booksellers through Ingram's global book distribution network. To order your copy post-free, please send a cheque or international money order for £8, made payable to Resistance, to PO Box 1009, London N4 2UU. Book arrives soon; please pre-buy!